SGGN Sprouts is composed of our two greenhouses whose growers generously plant and tend starts for our giving gardens. Located in Wallingford and Ballard, our greenhouses operate February through July. 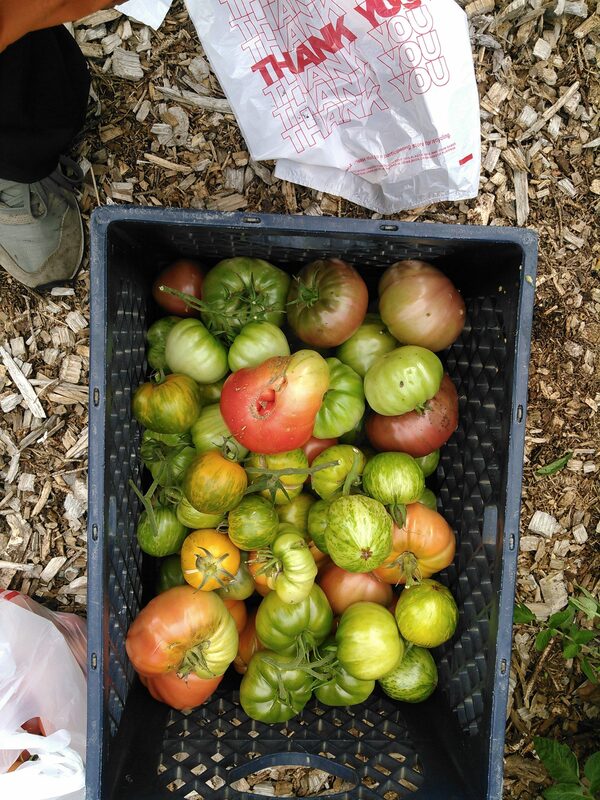 Confirmed: we’ll distribute tomatoes May 18-20, 2018 at the Ballard greenhouse location. We planted the seeds and this year they ALL sprouted: so please come and get them for their new homes. Some summer lettuces also remain. There’ll be a few boxes to use to take them to your giving garden, but it’s best to bring your own. And this will also be a good time to bring back those 4 inch square pots. (Preferably clean). This entry was posted in Giving Garden, SGGN Sprouts on May 11, 2018 by Dianne. This distribution is TENTATIVELY scheduled for May 18-20, if nighttime temperatures continue to be 50 degrees farenheit. TOMATOES: in general, plant out when nighttime temperatures are reliably at or above 50 degrees F. Apply about ¼ c of complete fertilizer into the soil around each plant, add bone meal if the soil is acidic. Water when dry and fertilize monthly (some instructions recommend fertilizing twice a month). All seeds started between March 3 and March 22. Slicer: Beefsteak Determinate may be planted in a large pot or raised beds. Seed is from Livingston Seed. 65 days to maturity. Plant 18-24 inches apart. 2-4 feet high. Slicer: Beefsteak: Indeterminate plants begun March 3 are 90 days to maturity. This seed is an heirloom from Territorial. Red slicing tomato. Plant out about 3 feet apart. Roma: Italian Roma – Bush Determinate; heirloom from Botanical Interests. Space 24 inches apart. 80 days to maturity; paste and canning tomato. Slicer: Marvel Stripe: Indeterminate – plant three feet apart. May have a mature height of 5 to 7 feet. 80 Days to maturity. Heirloom. Slicer. From Renee’s Garden seed company; certified organic. Slicer: Moneymaker: Indeterminate plants ripen 75-80 days after transplanting. Heirloom from Botanical Interests seed company. Certified Organic seed. 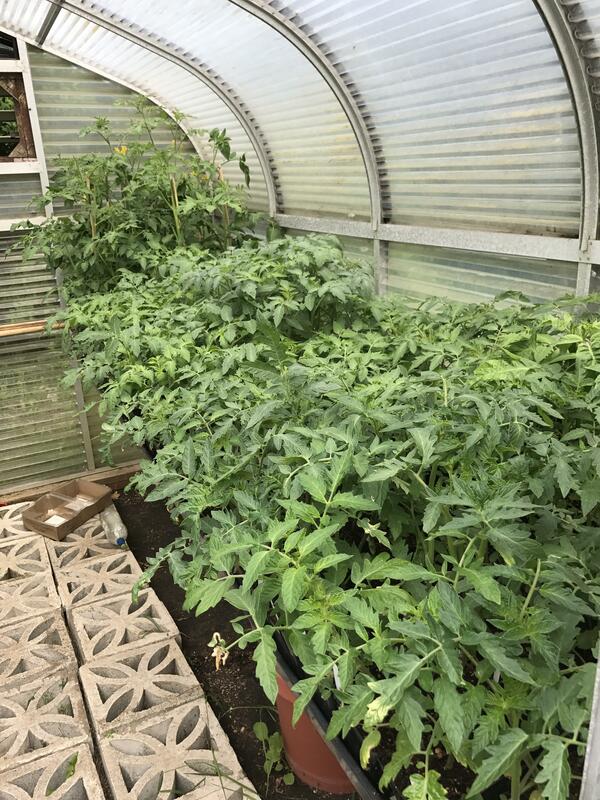 Space 24 inches apart — Poling or trellising is suggested. Fruit is versatile for use fresh or cooked. Slicer: Orange Oxheart: Indeterminate; plant 18-30 inches apart. Large orange-yellow tomatoes for slicing. From Territorial Seed Company. 90 days to maturity. Roma: Pink Tiger: Indeterminate; for fresh eating, canning, juice, sauce. Organic seed is from Johnny’s select seeds. Elongated dark pink tomato with yellow-orange striping. Considered to have a balanced flavor. Heirloom open-pollinated 70 days to maturity. Slicer: Rainbow’s End : Indeterminate up to 6 feet high. This packet of heirloom seeds from Renee’s Garden includes Brandywine, Green Zebra, and Marvel Stripe. Roughly 80 days to maturity.) We recommend you take a significant number of these to increase your chances of getting some of each variety. Roma: San Marzano: Indeterminate heirloom variety from Seeds of Change and Botanical Interests. 2 oz fruit; Italian paste variety. Plant 24 inches apart. Large plants, up to six feet tall. 80 days to maturity. Slicer: Siletz: sets fruit in colder weather, and many of the earlier fruits are seedless. 52 days to maturity. Plant two to four feet apart. Certified Organic Seed is from Irish Eyes, and is an heirloom. Slicer: Summer Feast Rainbow: Indeterminates up to 6 feet high. This packet of heirloom seeds from Renee’s Garden includes Black Krim, Sweet Persimmon (big/meaty/orange); Costoluto (deep-red, juicy for fresh eating.) We recommend you take a significant number of these to increase your chances of getting some of each variety. 80 days to maturity. Cherry: Sungold F1 Indeterminate from Territorial Seed. 65 days to maturity. Plant 18-30 inches apart. Cherry: Sweetie from Burpee. Plant 12 inches apart; grows 3-4 feet high. 70 days to maturity. Can plant in a pot. Cherry: Tasty Treat Indeterminate from Burpee; plant 3-4 feet apart. 65 days to maturity. PEPPERS: in general, peppers can be grown in pots – which are warmer than soil, generally – and I keep the pots next to a concrete rockery. I also bring them indoors to continue to ripen if the autumn rains arrive before harvest. Watch for and aggressively treat for aphids and slugs. Water generously, but let soil dry out some between watering. (I use saucers under the pots, and tend to water from the saucer so the plant can take up its own water.) They do not like our shorter day-length winters. Excellent source of Vitamins A and C.
Habanero hot pepper (by reputation, 50x hotter than jalapeno); heirloom from Bounty Beyond Belief seeds. Space 18-24 inches apart; plant grows about 36 inches tall but peppers are not large. 98 days to maturity (it will eventually mature to right orange-red but it is spicy even before maturity.) Prefers soil temps of 75 degrees when transplanted. Fertilize when plants are 6 inches tall and again in mid-summer. Ecuadorian Yellow Picante: 80 days; 3-4 inch long bright yellow pepper narrow is spicy “like cayenne”, can be used fresh or in sauces. Spicy even while still green. I personally have not grown these before. Eggplant Transplant 2 feet apart into rich soil in full sun when night temperatures are securely above 55 degrees. Fertilize regularly throughout the season. Consider using black plastic mulch and row cover. Asian Trio: any one of these plants could be Asian Bride F1 (magenta), Charming F1 (white) or Farmers Long F1 (purple). We recommend you take several seedlings to increase your selection. Seed is from Renee’s Garden. Plants grow 2 to 2.5 feet high and are 70 days to maturity. Rosa Bianca: Organic seed from Territorial seed Company; 80-85 days to maturity. Italian heirloom with rosy pink cast over a creamy white base. Mild. Plant 12-18 inches apart. 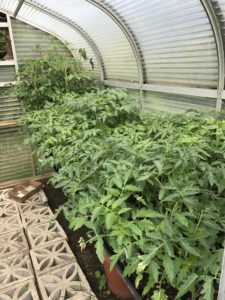 This entry was posted in Growing Tips, SGGN Sprouts on May 8, 2018 by Dianne.